I Challenge Diabetes is excited to announce our upcoming Sports Camps! 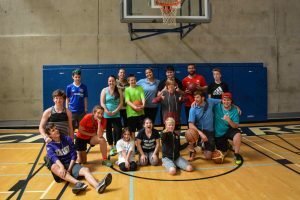 Participants are invited to join their peers living with T1D to take part in a basketball and sports workshop in the morning and a dance/drama workshop in the afternoon, all within ICD’s framework of optimizing blood glucose management during exercise and creating a positive, supportive environment where kids can learn and grow together! This day long event features a Parent Workshop in the morning for parents and caregivers to come together to discuss navigating T1D and the school system. We will be exploring our positive One-Team Approach – proven to overcome barriers in schools across the province! Sunday March 17, 2019 ICD Sports Camp will be coming to Sarnia! Camp Overview: This camp is a multi-sport day program that will provide diabetes support, education, mentoring and normalization all integrated with awesome workouts, skill development and a whole lot of sports camp fun for all ability levels. Our leaders integrate diabetes management into the camp day seamlessly, giving you a chance to send your child to camp with their friends or siblings, with the support they need to fit right in and have fun. 12pm – 1pm Lunch/BG check and carb counting games! Time: 9:00 am until 3:00 pm. Who: ICD Sports Camps are open to children with and without type 1 diabetes aged 5-15. ***Please choose the family ticket when registering, and add family members under the Additional Participant ticket, so we have ages, allergy info and dietary restrictions for each member of your family attending. Thanks to our local sponsor, Medtronic, lunch will be provided! We are happy to accommodate any and all dietary and allergy concerns/requests. Please bring a water bottles, diabetes supplies, test kit, running shoes, low supplies and snacks. We will have Dex4 and Clif bars on hand. If finances are a barrier, please contact us at [email protected] to enquire about our empowerment fund.